Do you see the ads that pop-up in theses chats? The last one that popped-up in y timeline was for a plumbing company that was shown cleaning out a sewer. Symbolic??? 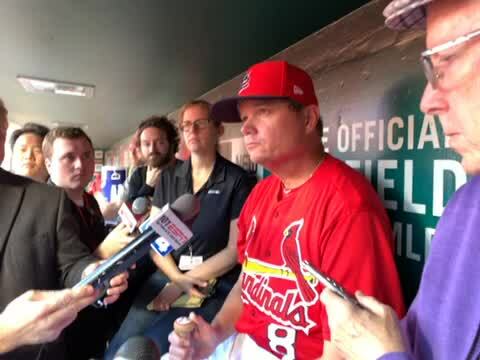 We are experts in metaphors at StlToday.com. 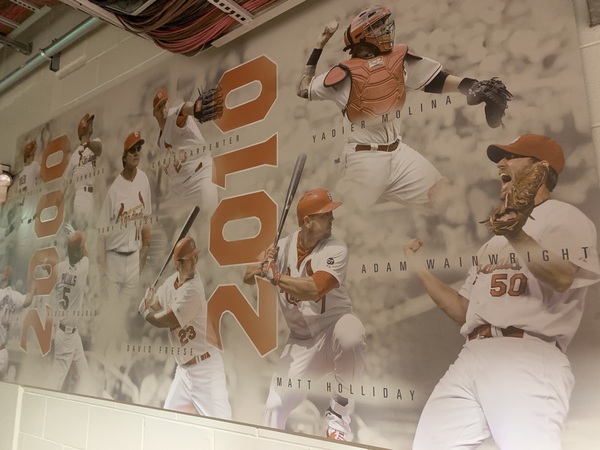 On a Busch Stadium tour last week, our guide proposed the next number on the wall would be 4, suggesting that he didn’t believe the Cards would ever retire Albert’s 5. I find it hard to believe that you don’t memorialize the best player of his generation, whose best years were with your team. #5 goes up on the wall? What other current or recent Cards will we see remembered around the stadium? When Albert Pujols is inducted into the Hall of Fame his No. 5 will go on the wall, there will be a statue, and there's no plan for anyone to ever where No. 5 again for the Cardinals. The Cardinals have been clear on this topic. This is not my opinion. This is from reporting. 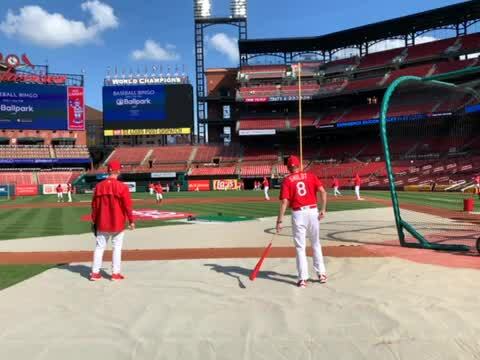 Just curious, why do the Cardinals have an off day on a Friday this week? I'm guessing it's because of April's usual odd schedule for opener rain outs at play with the new MLB off day rules? Don't recall a Friday off before other than after an opener. Have to step down to do some reporting. I will be providing some multimedia elements to the chat from here, and I'll pop in and out to answer some questions. 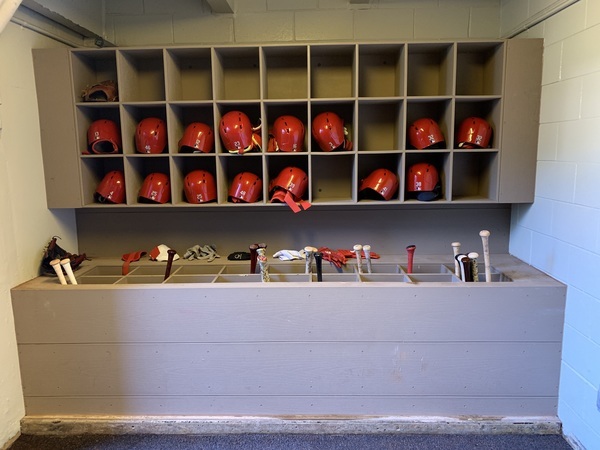 We'll try to go right up to first pitch, assignments permitting. 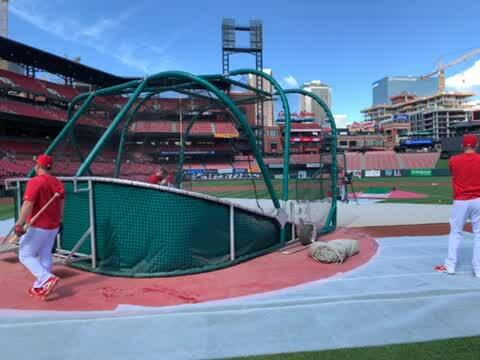 Paul Goldschmidt taking BP against a hugh velocity machine. He, Gyorko, and Wieters are out here. Fascinating work with new hitting coach Jeff Albert. Some Ball talk with Shildt. Jordan Hicks just jumped to catch a ball over the wall and take back a BP “homer” from Yadier Molina. Many laughs ensued. Alright. Let's plunge back into the questions. Thanks for giving me the time to head down and do some reporting. Tommy Pham, 43 straight games of being on base, amazing huh? Tampa Bay record, you bet. Mo missed the boat on Andrew Miller several years ago when the Yankees signed him. BTW, no injury issues with him at that time. 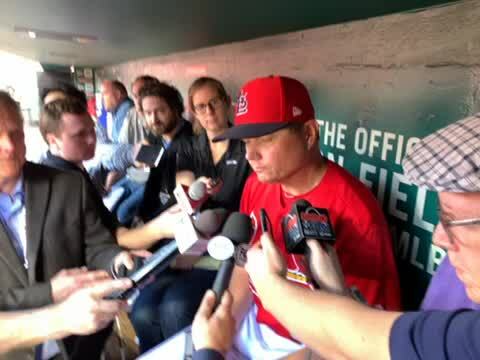 Also, the Cardinals talked to him, explored what a contract would look like. Didn't have the closer role to offer him, and weren't interested in paying closer money. So there's that. Mr. Goold: Other than in a couple of instances during the course of a game, a strikeout is just another out. If MLB wants to improve the pace of play, then the umpires need to start calling pitches that are a strike a strike. Based on what I've seen so far, the home plate umpires are sqeezing the pitchers. The hitters will either adjust and swing at the pitches, or they will be called out as they should be. It is my belief that one way to pick up the pace of play is to lower the strike zone. Even slightly. Force hitters to put that ball in play -- or at last try. Bring back the sinker. Give more depth the strike zone and watch hitters and shifts adjust, and see those balls in play. Voila. Some of the angst with Marcell stemmed from his weakened arm last year, then his apparent lack of off season rehab, coming into camp with more weight, and lastly his poor start this year. Do you know the magic words Molina used with Hicks yesterday? I could use some of those. Take a breath. Slow down. Stop rushing. Tell Shildt to get his hips cleared and keep his hands back longer! Also fix his launch angle. There’s no money in grounders! He is not taking fungo advice from a baseball writer. Thanks for your chats and also podcasts helps me keep in touch with the red birds from the other side of the Atlantic. 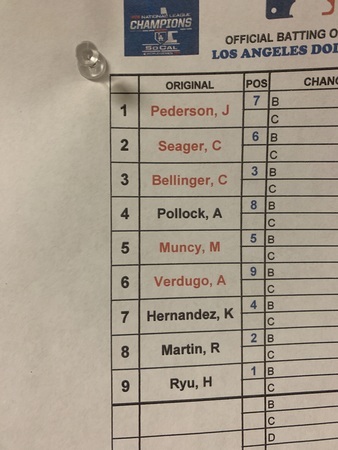 Good to see skip Schumaker in your line up which other ‘bench’ players have been similarly underrated in recent years? Greg Garcia. Excelled as a pinch-hitter. Abe Nunez. He excelled when asked to start. 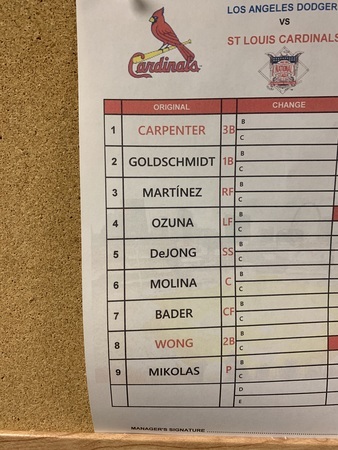 Why do the Cards get a 26th man this weekend for a two-game series? Collective Bargain Agreement assures it. Part of baseball's international travel rules. Derrick, does Munoz get paid a minor league salary in Memphis? Come back, Derrick. We're sorry that the guy called you "Rich." I wish it was just rich. But it's not Rich, either. I know Wieters wasn't expecting much playing time, but do you think he thought it would be this bad? Do you know if he's the only catcher to not have a start yet? If he didn't think it was going to be this bad, then he wasn't paying attention. And he was paying attention. He's going to start one of these games against the Dodgers.